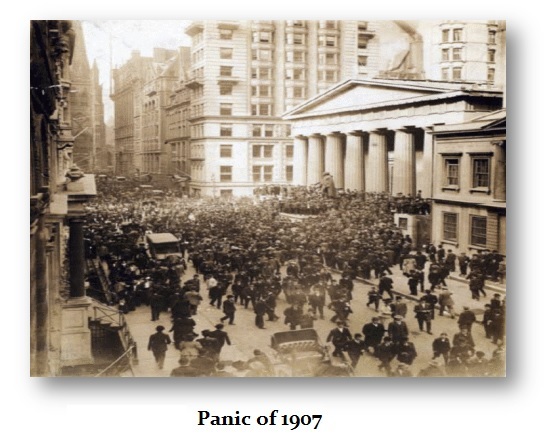 The Panic of 1907 came after the 1906 San Francisco Earthquake and that exposed the entire problem of regional internal capital flows within the United States caused by the business cycle and the great variety of localized economies. 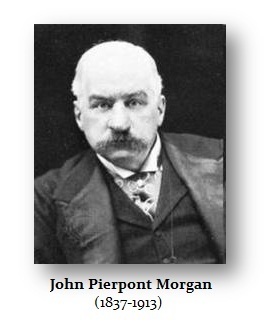 Indeed, such a period of a temporary shortage burst forth during the Panic of 1907 and it was John Pierpont Morgan (“JP”)(1837-1913) who saved the day, although most have criticized him ignoring his great patriotism and contribution to the country. The Panic began when there was an attempt to manipulate the market in United Copper Company that was a short squeeze which backfired. This was the catalyst, not the cause. It was the spark that ignited the Panic that took place. They borrowed money to buy stock to create the squeeze from the Knickerbocker Trust and suddenly they could not pay back their loans bringing the bank into failure. J.P. Morgan gathered his associates to examine the books of the Knickerbocker Trust but found it was insolvent and decided not to intervene to stop the run. When it became clear the Knickerbocker Trust would fail, the run spread to other banks and a contagion grew. The Trust Company of America asked Morgan for help. Morgan now brought in First National Bank and National City Bank of New York (later Citi Bank), and the US Secretary of the Treasury. Morgan had a quick audit of the bank and declared that this was where to defend. As the run began, Morgan worked with his associates to sell the assets of the bank to free up cash for the depositors. The bank survived the close of business. Morgan knew that this collapse in CONFIDENCE would not the end by just saving the Trust Company of America. Morgan now summoned the heads of various banks in New York and kept them until they agreed to provide loans of $8.25 million. Morgan convinced the Treasury to deposit $25 million in NY banks. John D. Rockefeller, the wealthiest man in America deposited $10 million with City and called the Associated Press to announce his pledge to help the NY banks. Nonetheless, the New York banks then, as now, proved to be their worst enemy. Despite the efforts of Morgan to create this infusion, they were reluctant to lend any money for short-term stock trading. The stock market crashed. By 1:30 pm Oct 24th, the president of the NYSE went to tell Morgan the exchange would close early. Morgan was livid. He understood that this would reinforce the Panic and he drew the line and would not allow it. Morgan warned that if the NYSE closed early, it would be catastrophic to say the least. Once again he summoned the bankers who arrived by about 2pm and Morgan pretty much yelled at them and warned that as many as 50 stock brokerage firms would fail unless $25 million was now raised in 10 minutes! By 2:16 pm, 14 banks pledged $23.6 million to keep the stock exchange alive. The money even reached the exchange by 2:30 pm, to finish trading at 3pm. The amount that was actually needed was only $19 million. Morgan himself hated the press that rarely treated him fairly, but this time he gave a rare comment. The next day, the NYSE needed more money and Morgan this time could only raise $9.7 million. Morgan directed the NYSE that the money could not be used for margin sales. The exchange made it to the close. Morgan knew he had to turn the minds of the people and to restore their critical CONFIDENCE to stop the Panic. Morgan now directed two committees to be formed to (1) persuade the clergy to preach calm to their congregations on Sunday, and (2) to sell the idea of clam to the press. Morgan was desperately trying to hold the nation together. Unknown even to his associates, the City of New York could not raise money through its bond issue and it informed Morgan that it needed $20 million by November 1st, 1907, or it would go into bankruptcy. Morgan himself contracted to purchase $30 million in New York City bonds. On November 2nd, one of the largest stock exchange brokers, Moore & Schley, was heavily in debt using the Tennessee Coal, Iron & Railroad Co stock as collateral. The stock was thinly traded and the stock was under pressure. Their creditors would now surely call their loans. Morgan called another emergency meeting and a proposal was put forth that US Steel Corp, would acquire the stock in bulk. Yet another crisis was looming. Runs were now likely to hit two banks on Monday. Morgan summoned 120 banks and told them he would not proceed with the US Steel deal unless they supported the banks. Morgan now locked them in his library and told them they had to come up with $25 million to save the banks. It took almost 2 hours. Morgan finally convinced them that they had to bailout the banks to save their own skins. They signed the agreement, and he unlocked the doors and let them leave. 1919). Breaking up companies he believed were monopolies was the main focus of Roosevelt’s administration. To save the day, he would have to see that the Antitrust Laws must yield. 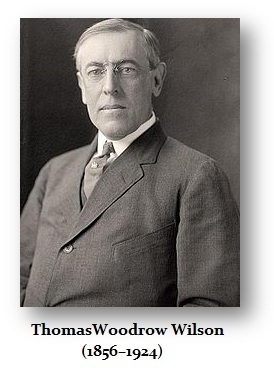 In 1912 President Woodrow Wilson (1856–1924) won the Democratic Party’s nomination for President, and in his populist-friendly acceptance speech he warned against the “money trusts,” and advised that a concentration of the control of credit may at any time become infinitely dangerous to free enterprise. It was the Anti-Wall Street agenda. Heinze’s corner fails spectacularly. Heinze’s brokerage house, Gross & Kleeberg is forced to close. This is the date traditionally cited as when the corner failed. The Exchange suspends Otto Heinze and Company. The State Savings Bank of Butte, Montana, owned by Augustus Heinze announces it is insolvent. Augustus is forced to resign from Mercantile National Bank. Runs begin at Augustus’ and his associate Charles W. Morse’s banks. Charles T. Barney is forced to resign from the Knickerbocker Trust Co. because of his ties to Morse and Heinze. The National Bank of Commerce says it will no longer serve as clearing house. Sec of Treasury George Cortelyou agrees to deposit Federal money in New York banks. Morgan persuades bank presidents to provide $23 million to the New your Stock Exchange to prevent an early closure. The City of New York informs J.P. Morgan associate George Perkins that if they cannot raise $20–30 million by November 1, the city will be insolvent. Moore & Schley, a major brokerage, nears collapse because its loans were backed by the Tennessee Coal, Iron & Railroad Co (TC&I), whose share value became uncertain. A proposal is made for US Steel to purchase TC&I. 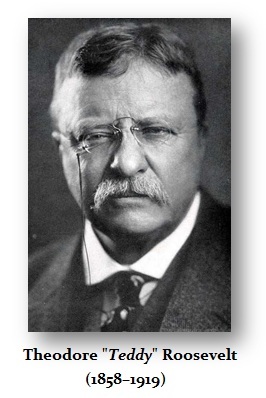 President Teddy Roosevelt approves U.S. Steel’s takeover of TC&I, despite anticompetitive concerns. 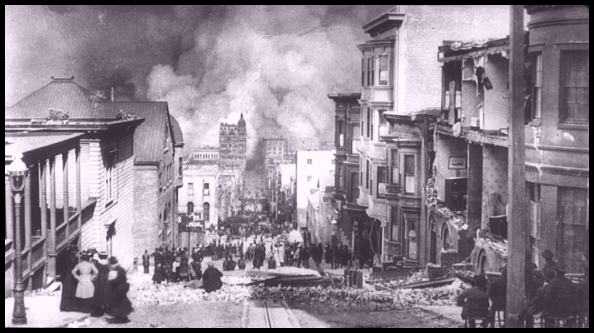 The California earthquake of April 18, 1906 ranks as one of the most significant earthquakes of all time. Today, its importance comes more from the wealth of scientific knowledge derived from it than from its sheer size. Rupturing the northernmost 430 kilometers of the San Andreas fault from northwest of San Juan Bautista to the triple junction at Cape Mendocino, the earthquake confounded contemporary geologists with its large, horizontal displacements and great rupture length. Indeed, the significance of the fault and recognition of its large cumulative offset would not be fully appreciated until the advent of plate tectonics more than half a century later. Analysis of the 1906 displacements and strain in the surrounding crust led Reid (1910) to formulate his elastic-rebound theory of the earthquake source, which remains today the principal model of the earthquake cycle. At almost precisely 5:12 a.m., local time, a foreshock occurred with sufficient force to be felt widely throughout the San Francisco Bay area. The great earthquake broke loose some 20 to 25 seconds later, with an epicenter near San Francisco. Violent shocks punctuated the strong shaking which lasted some 45 to 60 seconds. The earthquake was felt from southern Oregon to south of Los Angeles and inland as far as central Nevada. The highest Modified Mercalli Intensities (MMI’s) of VII to IX paralleled the length of the rupture, extending as far as 80 kilometers inland from the fault trace. One important characteristic of the shaking intensity noted in Lawson’s (1908) report was the clear correlation of intensity with underlying geologic conditions. Areas situated in sediment-filled valleys sustained stronger shaking than nearby bedrock sites, and the strongest shaking occurred in areas where ground reclaimed from San Francisco Bay failed in the earthquake. Modern seismic-zonation practice accounts for the differences in seismic hazard posed by varying geologic conditions. As a basic reference about the earthquake and the damage it caused, geologic observations of the fault rupture and shaking effects, and other consequences of the earthquake, the Lawson (1908) report remains the authoritative work, as well as arguably the most important study of a single earthquake. In the public’s mind, this earthquake is perhaps remembered most for the fire it spawned in San Francisco, giving it the somewhat misleading appellation of the “San Francisco earthquake”. Shaking damage, however, was equally severe in many other places along the fault rupture. The frequently quoted value of 700 deaths caused by the earthquake and fire is now believed to underestimate the total loss of life by a factor of 3 or 4. Most of the fatalities occurred in San Francisco, and 189 were reported elsewhere. (Excerpted from Ellsworth, 1990).